In the post-Gaza disengagement scenario, Palestinian president Mahmoud Abbas faces a daunting set of interrelated challenges, both internal and external. Domestic challenges include preventing the resurgence of Palestinian Islamic militancy against Israel, rooting out corruption in the Palestinian Authority (PA), carrying out financial, judicial, and security reforms, and institution building, as well as reviving a paralysed economy. Abbas external challenges include persuading Israel to return to the negotiating table to discuss the establishment of a Palestinian state, including the final status issues, such as the future of Jerusalem and right of return of Palestinian refugees. The biggest internal challenge before Abbas is to bring the militant groups such as Hamas, Islamic Jihad, and the al-Aqsa Martyrs' Brigade, who advocate violent resistance to the occupation, into accepting continued bilateral negotiations with Israel. They also pose a serious challenge to the PA and its efforts towards state-formation within a secular nationalist framework. Hamas has already defied President Mahmoud Abbas by repeatedly vowing to continue its armed attack against Israel. Abbas has resisted pressure from the United States and Israel to confront them head-on, instead preferring to negotiate with them and seeking to co-opt them into the mainstream political process. Hamas has indicated a degree of pragmatism and flexibility in recent statements vis-'-vis the PA and Israel. For example, it has largely adhered to an informal cease-fire declared in February and recently expressed interest in participating in the Legislative Council elections to be held next year. Another task before Mahmoud Abbas is to curb widespread corruption and ineffectiveness plaguing the Palestinian security and justice systems. A recent study conducted by the Strategic Assessments Initiative (financed by the Dutch and Canadian governments) and prepared in close co-ordination with Lt Gen William E Ward, the US official in charge of the effort to overhaul the Palestinian Authority and its security apparatus, has revealed that Palestinian security forces are in complete disarray, in contrast to the militant groups which are better armed. Other problems include the continuing power of personalities and clans, which often create alternative, informal chains of command and weaken the authority of the PA Interior Minister. These problems are closely tied to the destruction of the Palestinian police infrastructure by the Israelis since the beginning of the second intifada in 2000. In a recent statement US Secretary of State Condoleezza Rice said that the United States was prepared to help train Palestinian security forces. Egypt has also offered to train Palestinian security forces. Early this year, the PA National Security Council (NSC) was formed as a first step in consolidating the varied security elements. According to the legislation, as President, Abbas is the supreme commander of three institutions which consolidate dozens of security services: General Intelligence (unifies PA intelligence organs), General Security (civil and preventive services), and the National Security Council (the basis of a possible armed force), thus bringing an end to as many as nine Palestinian security services in the West Bank and Gaza each. Many view this development as positive, noting Abbas' attempt to unite the disparate intelligence apparatuses. Still others contend that such a reform masks underlying problems of an absence of power-sharing and imprecisely assigned duties. In addition, a much-needed step is to ensure that the PA has a viable and independent system of judicial administration. Restructuring the justice system should begin with unifying the myriad laws in the West Bank and Gaza Strip and creating an integrated body of laws. The institutions that underpin the rule of law - such as courts, security services, and prisons - should be linked and made interdependent. Most democratic countries exert a combination of executive and legislative supervision over internal security forces, and the judiciary holds these forces accountable if they contravene laws or violate constitutional provisions protecting individual rights. Given the executive predominance in Palestinian political arena, a model combining legislative and judicial oversight would be an appropriate arrangement. The PA has been repeatedly criticised for non-transparency, corruption, and cronyism, and Palestinian opinion surveys consistently reveal public anger over corruption. The World Bank in its governance indicators ranks the Authority in the bottom 16 per cent of governments around the world in its ability to control corruption and halfway down the scale in terms of an effective rule of law. The Transparency International Global Corruption Report (2004) showed how vast elements of international aid had never reached its target population owing to poor management and fraud. Even the Al-Jazeera news agency refers to the large reserves hidden in the coffers of the Palestinian Authority itself. The international donor community is slowly coming to the conclusion that change is essential if the Palestinian Arabs are to receive further and continued financial support. One of the most pressing domestic issues Abbas faces is economic stagnation. 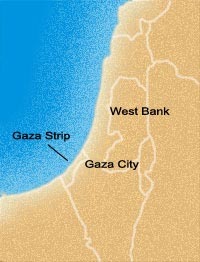 A December 2004 World Bank report warns of 'the potential disintegration of the Palestinian economy under the sustained pressure of conflict and Israeli closure policies and reveals that within the territories administered by the Palestinian Authority '47 per cent of Palestinians live below the poverty line' and that 'as many as 600,000 Palestinians cannot afford to meet their basic needs in food, clothing and shelter to survive.' It is suggested that money is required particularly in the fields of education, health and social security. It is worth noting that an investment of an estimated $10 billion since 1993 has bought neither peace nor an economic revival. According to a section of international economists, the blame for this dismal state affairs lies with logistical restrictions imposed on the Palestinians. Nigel Roberts, World Bank Country Director for the West Bank and Gaza echoes these thoughts: 'Closures are a key factor behind today's economic crisis... They have fragmented Palestinian economic space, raised the cost of doing business and eliminated the predictability needed to conduct business.' 'Closures' include travel restrictions, roadblocks, restrictions on Palestinians entering Israel for employment and more. The hope is that in the post-Gaza disengagement scenario, the freedom of movement will push the Palestinians towards economic progress. However, this will only happen if Israel is satisfied with the Palestinian security arrangements preventing smuggling of weapons and militant activities. At this stage, Palestinian President Mahmoud Abbas needs the assistance of the US to build a bridge to the future. The two sides have divergent expectations after disengagement: Sharon wants a pause to absorb the political repercussions on home turf and Abbas wants to open channels for negotiations on the 'final status' issues and the 'two-state' solution. With Israeli national elections imminent as early as spring next year, the conventional view is that Sharon will be forced to move more towards the right to fend off the challenge by former Prime Minister Benjamin Netanyahu and therefore, there will be no movement towards peace talks. On the other hand, Abbas must be able to show to the militant groups that his way ' the way of non-violence ' is paying off. Here the US administration should step in to revive the Road Map to peace by negotiating a common understanding on every Israeli and Palestinian obligation. Officially, the Palestinian Authority opposes Phase 2 of the Road Map that calls for creation of a Palestinian state with provisional borders. But they would be willing to accept a provisional state if there are mutual agreement on principles defining a Palestinian state and a short time table for negotiating a final status agreement. The most contentious issue here is the West Bank separation barrier that cuts into wide swathes of land Palestinians want for a state. Some Israelis contend their security depends on the construction of the barrier, noting decreased suicide bombings in Israel since the barrier's construction. Critics of the barrier see it as de facto Israeli annexation of portions of the occupied West Bank. Further, the Jewish settlements in the West Bank wreck the contiguous nature of the area, an imperative for a viable Palestinian state. While announcing his readiness to evacuate some of the smaller settlements, Sharon has pledged to 'strengthen' Israel's hold over the blocks, where the vast majority of settlers live. The proposed fence route and new construction in the settlements, called the 'thickening' of settlements are meant to achieve this goal. A core domestic issue for Abbas is the release of Palestinian political prisoners. Abbas has publicly stated 'in principle we work for every prisoner to be released, but what we are looking for is the release of those who have spent many long years in jail.' By June 2005, Israel had released around 2000 prisoners, with an estimated 7,000 political prisoners, still languishing in Israeli jails. Both sides would also have to tackle the problems of the status of Jerusalem and of the Palestinian refugees. Israel claims undivided Jerusalem as its eternal capital, while Palestinians seek to establish a capital for their state in East Jerusalem. Abbas has repeatedly asserted that the capital of any Palestinian state would be located in the eastern portion of Jerusalem. President Abbas, himself a refugee, has made several unequivocal statements in support of the right of return for Palestinian refugees to their 'original' homes in Israel. Some suggest that Abbas may relax his stance on the refugee issue if other outstanding issues are amicably resolved. First and foremost, Mahmoud Abbas must address the question of violence. So long as violence takes place and Israel continues to destroy Palestinian infrastructure and impose closures on Gaza, Palestinian Authority would be incapable of delivering services to its people. So a political process that restores law and order to Palestinian society is imperative in the present circumstances. Abbas' decision to hold parliamentary elections in January next year and his efforts to rein in Palestinians militant groups to join the political process is a step in the right direction. Abbas' agenda of police and security reforms, if carried out, would help him build his authority and strengthen his position, raising the costs to Hamas and others of challenging him. The Palestinian President must also work towards securing the international economic aid and labour-intensive projects as initial steps towards restoration of the economy of Gaza. If a peaceful environment prevails, Gaza's economy can also have unencumbered access to the West Bank and the outside world. The Middle East Road Map for peace has yet to be negotiated and here the US can act as mediator, bringing both the sides to work out a solution to contentious issues, within the overall framework of a two-state solution.